Throughout the years I have been challenged on several occasions to “love” someone who was truly unlovely. Why love them, you may ask? Over and over again in God’s word He tells us and even sometimes admonishes us to love. True, there are times when we might choose to hate someone rather than love them, but when we choose hatred over love we might just miss out on some blessings. In this Christian study walk with me through some Bible examples of how you can choose to love the unlovely. Mark 12:29–30 And Jesus answered him, The first of all the commandments is, Hear, O Israel; The Lord our God is one Lord: And thou shalt love the Lord thy God with all thy heart, and with all thy soul, and with all thy mind, and with all thy strength: this is the first commandment. In this passage Jesus was being questioned by the people (in this case one particular scribe) about what was the greatest of all of the commandments. Now this may have been in reference to the Ten Commandments or even all of the others that the Jews made up (depending upon how you count them this may be as many as 700!). As Jesus frequently did when teaching the people He referred back to Old Testament writings to get a point across, especially to those who really knew and studied the law. Why do we love God? Because He first loved us (1 John 4:19). How much did He love us? He loved us so much that He gave the ultimate sacrifice: He gave His only begotten Son to die in our place. Jesus was perfect and therefore did not have to die (which is the wage of sin; Romans 6:23). Instead He willingly gave His life as ransom for ours. Jesus did this for all people — lovely and unlovely. He died for us while we were yet sinners (Romans 5:8). Jesus loved us and so we should choose to love Him and His Father God. Jesus healed the sick, fed the hungry and made the lame to walk. These were all social classes that were considered unlovely. He also listened to the children. In our world today we often do not consider the opinions of the young and many of our ministry outreaches are for those older than children. Shouldn’t we be investing in our children since they are the ones that will spread the good news of the gospel of Jesus Christ when we are gone? 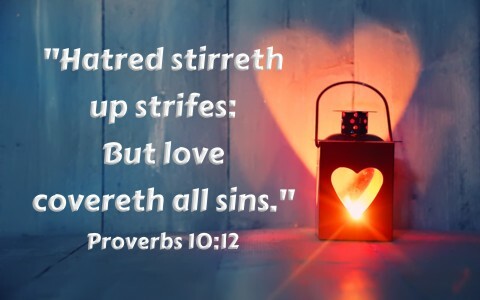 Consider the following scriptures for further study on how we can love the unlovely through compassion: Mark 6:34; Mark 9:23; Matthew 9:22; Matthew 9:36; Matthew 14:14; Luke 8:43-48; James 5:14; 1 Timothy 4:12. Jesus was seen having meals with tax collectors, speaking with a Samaritan woman and honoring a woman for breaking a very expensive bottle of perfume. In some cases he even washed their feet — which was considered to be the dirtiest part of the body since in those days they wore sandals. In this Jesus showed that serving even these people was a way to love the unlovable. Read about how Jesus spent His time: Matthew 9:10-11; Mark 2:13-17; Luke 19:1-10; Luke 7:37-40; John 4:1-25; John 13:1-17. Philippians 2:3–4 Let nothing be done through strife or vainglory; but in lowliness of mind let each esteem other better than themselves. Look not every man on his own things, but every man also on the things of others. Matthew 5:43–45 Ye have heard that it hath been said, Thou shalt love thy neighbour, and hate thine enemy. But I say unto you, Love your enemies, bless them that curse you, do good to them that hate you, and pray for them which despitefully use you, and persecute you; That ye may be the children of your Father which is in heaven: for he maketh his sun to rise on the evil and on the good, and sendeth rain on the just and on the unjust. How and Why We Can Love the Unlovable? Truly it is difficult to love some people but as we see from the example of Jesus and the truth of God’s word we can do it. He gives us the power through the Holy Spirit to demonstrate compassion and spend time with social outcasts just as Jesus did. We can even do so many things that we think we cannot do if we just call upon the Holy Spirit to show us how to do it. God loves the unlovable and He loves us … even though we are sometimes unlovable and ugly too. Years ago I came in late to a Sunday School lesson being conducted in the sanctuary of the church. The senior pastor was asking all of the folks in attendance to kneel with him in prayer for the salvation of one al Qaeda fighter per week. It was shortly after 9/11. I could not do it. I asked God to help me. I resisted and the help did not come. I thought surely this was not going to happen…EVER…and I certainly wasn’t going to pray for it, because I wanted them all to burn in hell forever. Great thoughts for a Christian, right? Sweet words of encouragement, Thanks for sharing DocReits. I pray that we can always be lovely and lovable. Previous post: Will All Israel Be Saved?